It’s hard to believe that nine years ago my husband and I shared our first date on Valentine’s Day. Since then we moved from Florida to California, started our careers, got married, bought a house, sold a house, bought another house and, generally, weathered life’s bumps hand-in-hand. These shared life experiences have brought us closer in ways that I would have never imagined during that first date dinner. So, nine years later, how do we celebrate Valentine’s Day? With pie, of course! I can think of no better way to say “I love you” than with this Chocolate Chess Pie. It’s made with my husband’s favorite Green & Black’s organic chocolate and it is out of this world (just like my hubby). The filling, with its chocolaty and ever-so-slightly gooey goodness, is reminiscent of a chocolate flourless cake. In fact, as shown in the photo, it rises very much like a cake (a full inch above the crust!) but the filling is also like a brownie in that it forms a thin top crust while it bakes. Can you imagine a not-too-rich, not-too-sweet, slightly gooey dark chocolate cake/brownie in a pie crust? Oh, it’s divine, especially if you eat it slightly warm with fresh strawberries on top! One warning though… this pie may not win “Best in Show.” As it cooled (and fell), the crunchy brownie layer cracked (hence, the reason for strawberries). But as the saying goes… true love is more than skin deep! I know that you’re gonna fall in love with this pie! It may be my new favorite. Crust: Single 9” pie crust made with 50:50 goat butter:Spectrum shortening. The crust is partially prebaked prior to addition of the filling. To pre-bake the crust, preheat the oven at 400⁰F. While the oven heats up, place the prepared pie crust in the freezer for 15 minutes. Once the crust is thoroughly chilled, arrange a long piece (16”) of heavy-duty aluminum foil so that it fits the crust like a second skin. Leave the extra length on either side so that the aluminum foil can be easily removed. 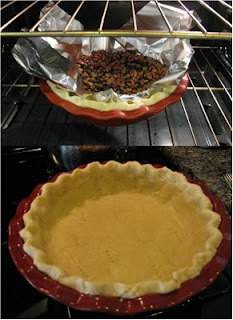 Fill the pie crust with pie weights or beans. Bake for 15 minutes. After the initial baking period, remove the pie weights and pierce the bottom of the crust 7-8 times with a fork. As you stick the fork in, give it a little twist to slightly enlarge the holes. Lower the oven temperature to 375⁰F and bake for an additional 10 minutes. Check the pie occasionally to make sure that it does not puff up; if it does, prick the problem area with a fork. A partially baked pie shell will be pale with slight browning when finished. To seal the fork holes, brush the crust with egg white and bake for an additional 2 minutes. Allow the crust to cool completely before adding the filling. To prepare the filling… melt the butter and chocolate in the top of a double-boiler (~5 minutes). Once melted, remove the top insert and whisk the butter and chocolate together until smooth. Allow the mixture to cool. Meanwhile, in a separate large bowl, mix the sugar, cornmeal and salt. Add the eggs, egg yolk, half and half and vanilla to the dry ingredients and mix thoroughly. Then whisk the cooled chocolate until smooth and stir it into the remaining ingredients. Pour the filling into the pie shell. Bake at 325⁰F for 35 minutes. Then rotate the pie 180⁰ and bake for an additional 30 minutes (or until the center of the pie is not longer jiggly). Allow the pie to cool at least 1.5 hours before serving. This pie is best served slightly warm (microwave 10-15 seconds). Comment: Prior to this recipe, I had never heard of a Chess pie and, like me, it originates from the South. Apparently, the trademark of a chess pie is the cornmeal used as thickener. Also, vinegar is sometimes added to curdle the eggs and provide added texture. All recipes include a fairly simple mixture of eggs, butter and sugar.